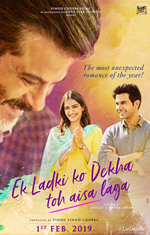 Dowload Good Morning Mp3 Song from Movie Ek Ladki Ko Dekha Toh Aisa Laga (2019) Sung By Vishal Dadlani & Shanon Donald. Good Morning song music is composed by Rochak Kohli and the movie is released on February 01,2019. Ek Ladki Ko Dekha Toh Aisa Laga have 4 more songs other than Good Morning that you can downlad from this website.